A rapid recovery shake with added Whey Protein, carbohydrates and vital electrolytes. Scientifically formulated to accelerate the bodyâ€™s recovery process after intense and prolonged physical activity. The nutrient requirement in athletes is highest immediately after intense and prolonged physical activity. The 30-45 minute window after training or events is a crucial time during which the body races to recover as quickly as possible. The bodyâ€™s evolutionary instinct to immediately replace muscle glycogen (our first and main source of energy) means that it will use whatever nutrients are available, and will metabolise Amino Acids present in muscle tissue, resulting in muscle wastage. By rapidly supplying both complex and simple carbohydrates to replace glycogen, as well as fast-acting protein to replace Amino Acids, the body recovers quickly, without breaking down existing Amino Acids. 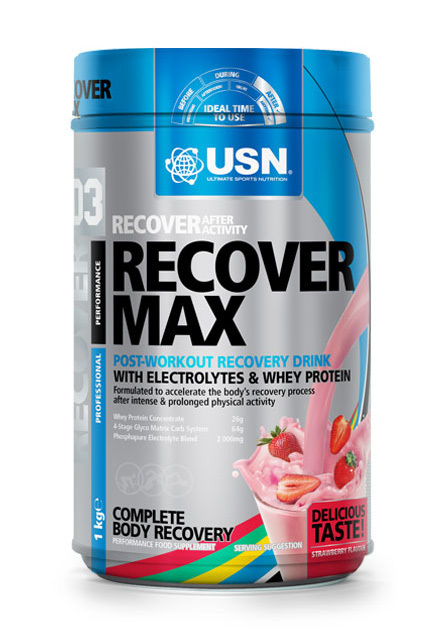 USN RECOVER MAX is precisely formulated as a post-training recovery drink, and/or a comprehensive energy, Amino Acid and electrolyte replacement drink to use during long periods of intense physical activity such as military training, Ironman triathlons, marathons etc. as well as shorter, highly intensive activities like spinning, power-lifting, weight-lifting, rugby etc. The carbohydrates consist of an ideal ratio of long chain glucose polymers for sustained energy supply, as well as fast-acting simple sugars (Dextrose Monohydrate) for rapid energy replacement and fructose (fruit sugar) to replace hepatic (liver) glycogen. Protein is supplied in the form of premium Whey Protein Isolate, which has the highest bio-availability, absorption rate and retention of all protein sources.